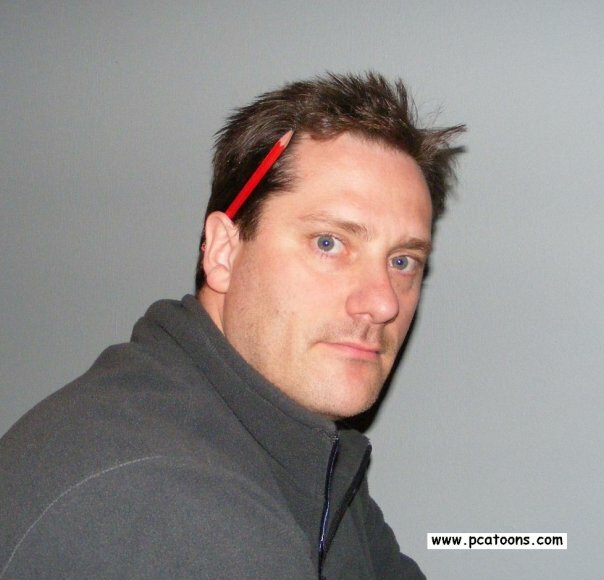 My name is Pierre C. Arseneault (AKA; PCA) I am a freelance cartoonist from New Brunswick, Canada. Why am I a freelance cartoonist you are asking yourself? Mostly because I have not been bitten by radioactive spiders, I have not been exposed to gamma rays or to my knowledge I am not from another planet so I have no superpowers and also I don't look good in tights. For those reasons I can't become a super hero. I also can't sing very well so becoming a singer is not an option and I am not good looking so I can't be an actor. Also I am too tall to be a Santa's helper and the job of Santa Clause is already taken. But I can draw good enough to be a cartoonist and so this is why I became a freelance cartoonist. To tell you about my work; in the past I have and still am publishing cartoons and cartoon puzzles in numerous newspapers, I have been commissioned to produce greeting cards for personal and corporate use, created t-shirts designs and worked on coloring / activity books for kids that were published by newspapers. I have also made illustrations for role playing game books and card games. And so until I become a professional Elvis impersonator in Las Vegas I will continued to be the self proclaimed emperor of silliness and I will keep on drawing until my fingers fall off. I thank you for visiting my site. Freelance Cartoonist and self proclaimed emperor of silliness.